Please subscribe to our new podcast feed!!! Or search for Fantasy Football Almost Daily and look for the show Scott Fish as the author. Best pick in the first round? BIggest reach in the first round? Weirdest moment of the first round? Alright, second SUPER CONTEST of the week. Free @BestBall10s $10 entry if you can correctly predict the first 10 players taken in NFL draft in order (teams not needed). Everyone who gets it right, wins. 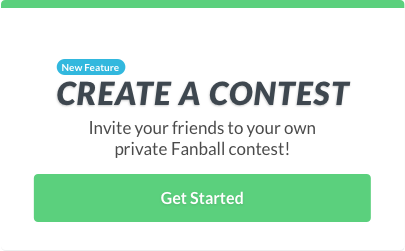 1 entry per person. Deadline 7:00pm CT. Must follow @BestBall10s. Today, @Bankster17 has two pitchers who you should start and one you should avoid at all costs. Here's what we think of that. 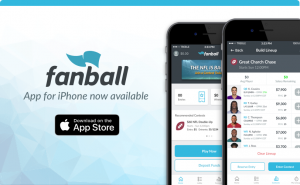 Welcome to Fanball FAAB, our weekly analysis of players who may be available on your league’s waiver wire. Words by Christian Peterson. Rankings and blind bid recommendations by Paul Charchian. All it took was 8 Jameis Winston interceptions in the equivalent of three games for Ryan Fitzpatrick to get his job back. Well, it wasn’t his job in the first place. But he had it. And then lost it. And now has it again. Neat. 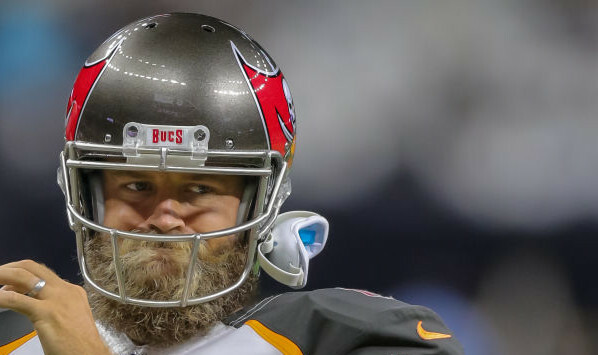 What you need to know is that Fitzpatrick threw for over 400 yards in three consecutive starts earlier this year, led a near-miraculous comeback in Week 8 while visibly rejuvenating the entire Buccaneers offense, and has already been named the starter for Week 9. THE BEARD IS BACK! Charch’s Blind Bidding Recommendation: 20%. In QB-heavy leagues, 30%. If you’re reading this, please send help. Charch is forcing me to include Smith. Everything you are about to read is said under severe duress. Take caution. And send help. Charch threatened to make me listen to “post rock” music and play board games for the next 48 hours if I didn’t include Alex Smith. For some reason, 50% of you are still holding onto Alex Smith. Despite him failing to top 178 passing yards in any of the last three games. Despite him failing to reach 300 passing yards in a single game this year. Despite him not having thrown more than two touchdown passes in a game, and being held to 1 or fewer in four of seven games. If I’m being kind to 50% of you, I would say that the reason you have wasted a roster spot on Smith for eight weeks is because you had this single Week 9 game in your crosshairs. You are savvy indeed, for the Falcons are among the worst pass defenses the NFL has to offer. Five of the six non-Nick Foles (NNF) quarterbacks they have faced have tossed at least 3 touchdown passes against them. Five of the six NNF quarterbacks they have faced have thrown for at least 335 yards against them. Alex Smith is not named Nick Foles. Via the commutative property (or something, I was told there would be no math) we can therefore deduce that he will throw for about 335 yards and three touchdowns this week. Charch’s Blind Bidding Recommendation: 3%. In QB-heavy leagues, 3%. Martin averaged 5.5 yards per carry in his debut as the Raiders new lead running back in Week 8. As expected, he dominated handoffs and gave way to Jalen Richard (8 catches, 50 yards) on passing downs. Martin is likely the goal line back in Oakland as well. His Week 9 matchup with the 49ers seems tempting, but San Francisco has held opposing runners in check, including limiting to Kareem Hunt to 44 rushing yards, David Johnson to 55 and 59 rushing yards in two games, and Todd Gurley to 63. Of course, they also yielded 2 touchdowns each to Hunt, Gurley, and Johnson so the recipe here is basically everything that makes Doug Martin Doug Martin. Which is to say, he’s probably good for about 60 yards on 16-ish carries with a possible touchdown. Charch’s Blind Bidding Recommendation: 25%. A simple reminder that Bernard is due back from his knee injury after the Bengals’ Week 9 bye. His ownership has plummeted to 39%, but he can be a useful fantasy tool even despite being on the wrong end of a backfield committee with Joe Mixon. Bernard is particularly helpful in PPR leagues because of his role as a pass-catcher out of the backfield, and Mixon hasn’t exactly been a bastion of good health during his first two NFL seasons. Charch’s Blind Bidding Recommendation: 10%. This is what happens when the two best running backs (Jay Ajayi and Darren Sproles, yes Darren Sproles) in your planned running back by committee get hurt. Since losing Ajayi in Week 5, Eagles runners Corey Clement and Wendell Smallwood have combined for just 159 rushing yards in the last three games, on a putrid 2.74 yards per carry average. Insert Adams, who led the Eagles with 9 carries and 61 yards during the Week 8 win over Jacksonville. Clement has been particularly awful (12 yards on 12 carries the last two games) and is in increasing danger of losing carries altogether. Adams could pay big dividends even if he can manage to eliminate just one of the two other options in the Eagles backfield. Charch’s Blind Bidding Recommendation: 5%. You say Trenton Cannon. I say Elijah McGuire. One thing we can all agree on; Isaiah Crowell just isn’t very good. You may remember Crowell from such amazing performances as Week 1, when he rushed for 102 yards and 2 touchdowns on 10 carries. Or Week 5, when he ran for 219 yards and a touchdown on 15 carries. What you may not remember is that he is averaging 2.36 yards per carry in the other six games he has played. And hasn’t topped 40 rushing yards in any of them. You may have forgotten about McGuire, who returned to practice from injured reserve in Week 7 and who could be activated as soon as this week. McGuire showcased some game-breaking ability last year in his rookie season, and is a more intriguing option than Cannon, who has been completely ineffective outside of a garbage-time drive in Week 7. Charch’s Blind Bidding Recommendation: 5%. With Royce Freeman banged up, Devontae Booker served the change-of-pace role behind starter Phillip Lindsay in Week 8. He was shockingly effective with over 100 total yards, and is worth an add at least until we know Freeman’s status, which is at this moment a subject of some debate. In any case, the Broncos have proven they are willing to split carries liberally amongst more than one back this season, so Booker is a decent roll of the dice while Freeman nurses his ankle back to full health. Charch’s Blind Bidding Recommendation: 1%. Sutton isn’t a high-volume player at this point, but he’s made some big plays and flashed the potential that made him a second-round draft pick. Sutton is worth a look even if the status quo remains in Denver past Tuesday’s NFL trade deadline, but he would immediately vault into must-add territory if Demaryius Thomas is dealt. EDIT: and that just happened! DT was traded, making Sutton a much bigger piece of the Broncos passing game. Charch’s Blind Bidding Recommendation: 30%. Moore is slowing getting into the mix in Carolina, delivering easily his best game as a pro with 5 catches and 90 yards against a good Ravens secondary in Week 8. Veteran Torrey Smith, whose knee injury paved the way for Moore’s breakout, is not expected to be out long. But the Panthers will be hard pressed to keep their first-rounder off the field after the impressive outburst that coincided with one of Cam Newton’s best games of the season as well. There’s massive potential in the next two matchups vs. the Buccaneers and Steelers, both of whom rank as bottom-5 pass defenses against opposing wide receivers. Charch’s Blind Bidding Recommendation: 5%. Okay fine, let’s take David Moore seriously. With another touchdown in Week 8, Moore now has four touchdowns in his last three games. Encouragingly, he also delivered season highs in catches and yards in Week 8 and has clearly surpassed Brandon Marshall on the Seahawks depth chart. With Doug Baldwin pulling a disappearing act and Tyler Lockett failing to attract many targets despite scoring in all but one game, Moore is an intriguing addition for a Seahawks stretch run that includes the 49ers (twice) and Chiefs in the fantasy playoffs. Charch’s Blind Bidding Recommendation: 5%. The last time we saw the Falcons, they allowed 143 yards to Odell Beckham and 167 to Sterling Shepard, a near-impossible feat against the previously punchless Eli Manning & Co. And since Alex Smith is all but guaranteed 335 yards and 3 touchdowns (see above), someone probably has to be on the other side of those passes. It could be Paul Richardson. And you could be the lucky beneficiary. I feel like I deserve some preemptive credit for the undoubtedly upcoming “Take a Chance on Me” selections of Smith and Richardson on the Week 9 edition of KFAN’s Fantasy Football Weekly radio show. Charch’s Blind Bidding Recommendation: 5%. Long after we’d left him for dead, Parker came off the pine in Week 8 due to injuries to starting wideouts Albert Wilson and Kenny Stills to post the breakout game we’d all written off weeks ago. It’s possible the sudden outburst was exactly what the Dolphins needed to ship the disgruntled Parker out of town at the trade deadline. It’s also possible he’s back in their good graces. More likely, this was just another brief and fleeting moment of upside from Parker, who has teased us before without ever finding any measure of consistency. It’s that same upside that makes Parker worth a look this week if you can stomach the uncertainty. Charch’s Blind Bidding Recommendation: 3%. Randall Cobb and Geronimo Allison both returned from injury last week, but MVS remained involved, easily out-targeting Allison and playing more snaps than Cobb. He appears to be more explosive than either player, and he also appears to be gaining Aaron Rodgers’ trust. The Week 9 matchup with the Patriots has shootout potential, so Valdes-Scantling could be a sneaky play this week. Charch’s Blind Bidding Recommendation: 3%. You’ll have to suffer through a Week 9 bye, but Doyle is absolutely worth an add after a triumphant return from injury. Missing since Week 2 with a hip issue, Doyle was heavily involved in a two-tight end attack alongside Eric Ebron, nearly single-handedly driving the Colts down the field for a go-ahead fourth-quarter touchdown drive against the Raiders. A previously devastated Colts passing arsenal is suddenly healthy with both Doyle and T.Y. Hilton back, and Doyle proved in Week 8 that he won’t necessarily take a back seat to either one. Charch’s Blind Bidding Recommendation: 3%.